Charles Blackman is best known as one of the Antipodean modernist artists to emerge in the post-war years in Melbourne, largely under the patronage of John and Sunday Reed. Blackman is also arguably one of Australian art’s finest draughtsmen. 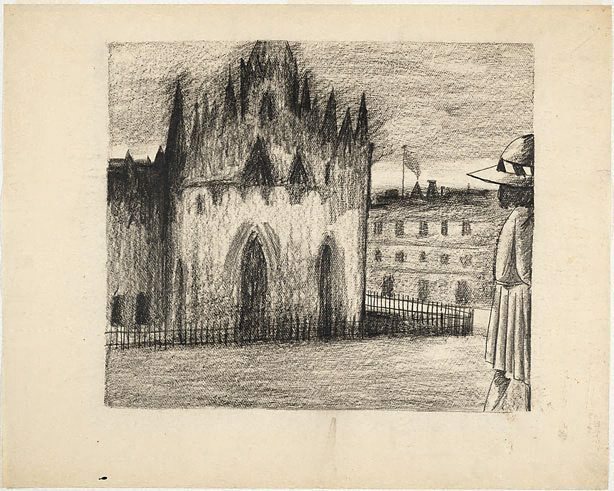 His schoolgirl drawings were the first consistent series of drawings he made, and were to a large part instrumental in establishing his reputation as a major Australian artist. The unsolved murder of a school friend of Blackman's first wife Barbara, was the spark for the 'Schoolgirl' series, begun in 1952 and further developed the following year. Figures, including schoolgirls, appear in desolate urban or industrial landscapes. The drawings have an eerie, surreality about them, complete with a sense of impending danger or menace. Blackman concentrated on making these drawings for a period of about eight months and he described them as '... the first complete works of art I ever did' (Thomas Shapcott, 'The art of Charles Blackman', London: André Deutsch, 1989 p.11). They have come to epitomize the best of his work. Signed in image l.l., blue ball-point pen "Blackman". Not dated.